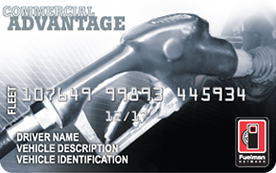 The Fuelman Commercial Advantage Fleet Card helps fleet managers save in overall fuel management costs. With detailed reporting and purchase controls, this card is ideal for businesses with mixed sized fleets that want to save in unleaded and diesel fuel, while preventing unauthorized purchases. The Fuelman Commercial Advantage Fleet Card delivers peace of mind to fleet managers who wish to prevent or identify suspicious driver activity. Relieve yourself of worry with a suite of fleet management tools such as detailed driver activity reports, customized card spending limits, real-time email alerts and the ability to lock and unlock cards instantly. Leave the uncertainty at the door by using one of the Fleet Management tools offered through the Fuelman Network. Whether you want to monitor driver activity or locate a gas station near you, the Fuelman Commercial Advantage Fleet Card comes with an online site locator and account management tool to stay connected with your fleet from anywhere. *Wholesale cost calculated as cost of fuel plus a small margin to cover freight and transaction fees. Actual savings vary based on the wholesale and retail price of fuel in the market. Customer's price will never be below Fuelman's cost paid to merchant. Program pricing is re-evaluated annually and subject to change thereafter. Walmart and Sam's Club transactions priced at credit retail. Transactions at Arco are subject to special pricing. **2¢ per gallon savings applies to all unleaded and diesel gallons purchased during first twelve months following account set-up. Program pricing is re-evaluated annually and subject to change thereafter. Program Terms and Conditions apply. Visit www.fuelman.com/terms/ for details. Fees may apply in some cases, such as for optional services, late payments and/or credit risk. Fuelman® is a registered trademark of FLEETCOR Technologies Operating Company, LLC.